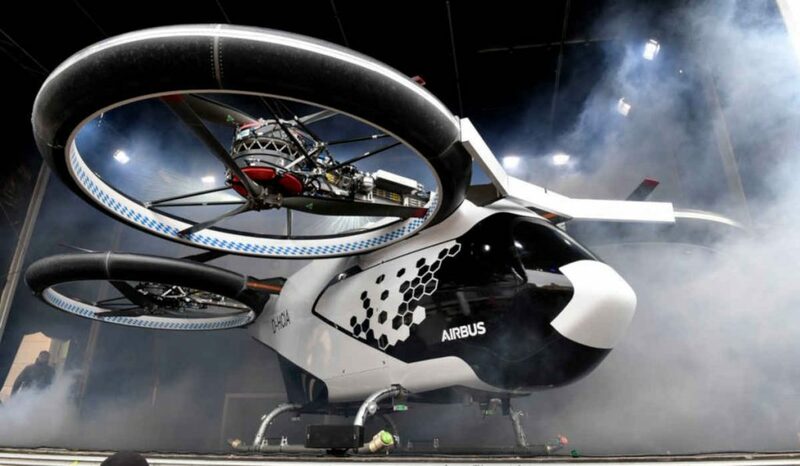 Airbus on March 11 in Ingolstadt, Germany, for the first time unveiled a demonstration model of its CityAirbus aircraft, targeting the Urban Air Mobility sector. The French company ultimately expects the electric Vertical Takeoff and Landing (eVTOL) vehicle to be fully autonomous. The CityAirbus, which is to be initially equipped with four 140 kW batteries (each generating 110 kWh of energy), eight rotors and seating for four, is scheduled to begin testing this summer in Germany at Manching airfield near Ingolstadt, where CityAirbus development partner Audi Group holds its biggest production site and the second-largest automobile plant in Europe. With 44,000 employees, Audi Ingolstadt by 2017 had produced more than half a million cars. CityAirbus was developed at Airbus’ factory also nearby in Donauwoerth, Germany. The company is initially targeting a cruise speed of up to 120 km/h and a 50 km range. It is to hold eight fixed-pitch propellers, powered by Siemens direct-drive engines that rely on an equal number of 100 kW electric motors. The fixed-pitch propellers of the CityAirbus present a different concept than Bell’s recently introduced (January 2019, full-scale design) Nexus VTOL, which features six tilting ducted fans – described as Bell’s powered lift concept. The Nexus is to be powered by a hybrid-electric propulsion system being developed by Safran. Nexus also includes technology partnerships with EPS, which will provide the energy storage systems; Thales, providing Flight Control Computer (FCC) hardware and software; Moog, developing flight control actuation systems; and Garmin will integrate avionics and the vehicle management computer (VMC). The millions – potentially billions – of R&D dollars being invested by aerospace companies like Airbus, Bell, Boeing and Safran, among others and well-funded start-ups, signals a growing need for aggressive action on regulation. There are also a handful of well-funded aerospace start-ups like Germany’s Volocopter (partnered with Daimler) targeting UAM – and, of course, Uber. Most helicopter manufacturers, and their key suppliers in areas from engines and structures to avionics and interiors, are in a position to add systems to the Urban Air Mobility sector (UAM), particularly under the current business environment of development partnerships.